Wander down our historic streets, follow the winding path of the river, chat with longtime merchants, and eat your way through local staples and trendy hot spots, all while taking in the warm, welcoming smiles of our people. Here, the fun awaits you. Plan your next day-long outing today and be sure to consider our suggested things to do, see and explore below. Trust us, from museums, to boutque shopping, to drinks by the water, we have what you’re looking for. Come join us. 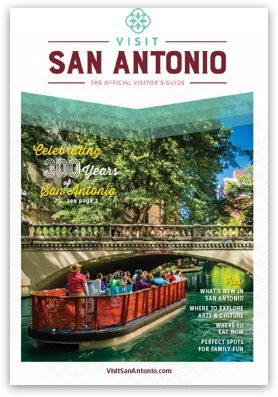 – Start your day by the river front for a trip around the world at the San Antonio Museum of Art (SAMA), where regular and rotating exhibits feature a comprehensive collection of ancient Greek, Roman, Egyptian, Latin American and Contemporary Art. – Near the San Antonio Museum of Art, don’t forget to look up under the overpass to admire the “glowing” work of Philadelphia artist Donald Lipski’s “F.I.S.H.” The exhibit features a cluster of 25 seven-foot-long creatures of hand-painted fiberglass resin that are anatomically correct figures of long-eared sunfish, which are native to the river. – Take a shopping break nearby and browse all things ¡Viva! at the Fiesta Store on Main for colorful, handwoven Mexican dresses and blouses, and festive home décor. – When hunger strikes, head towards trendy Southtown to grab dinner and drinks at Maverick, a Texas Brasserie – a neighborhood hangout and food lover’s destination. – Then, linger back downtown and explore the sights, sounds, local shops and pop-up boutiques along the banks of the famous River Walk.